A garden is growing just down the street from Jeremy Bloeser's office on Parade Street's 400 block. He talks about it while he walks down to it, picking up little scraps of litter along the way. Not too long ago, he said, a crumbling, uninhabitable house – then, nothing but unused space – was all that occupied that corner lot, one of many like it on the bay-fronting face of Erie's oldest neighborhood. Now, though, the lot's a space starting to come into new bloom: Rare and not-so-rare herbs and spices, varieties of blueberries, raspberries, and other fruits and more, all artfully assorted in hand-painted garden boxes and flanked by white fencing. But the fencing isn't there to keep anyone out. "Everything here is edible," Bloeser, executive director of the Bayfront East Side Taskforce, said as he looked over the garden's bounty recently. And with the exception of a few marked boxes that are privately gardened by neighborhood residents, it's all there for the picking. 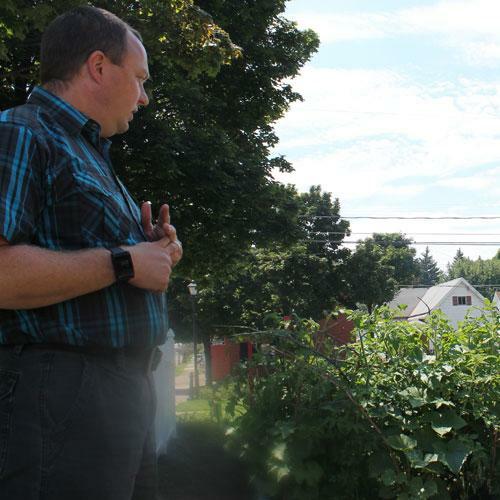 The community garden was first established and has been growing since April at the corner of Parade and East Fourth streets. It's just one of multiple initiatives and efforts currently under way through B.E.S.T., the city's first nonprofit organization hyper-focused on revitalizing Erie's East Bayfront neighborhood, situated directly east of the city's downtown improvement district and encompassing 25 blocks between Holland and Wayne streets from East Sixth to East Front streets. Out of all that B.E.S.T. does – from major projects to remove blighted properties and provide new, affordable housing to smaller-scale endeavors to boost neighborhood pride and participation, Bloeser said the garden is "small" and just "one of many [undertakings]." "Nobody really realizes how comprehensive [the effort] is," he added. B.E.S.T. is primarily funded through community donations and ongoing partnerships, the largest of which are with Erie Insurance Group and, now, UPMC Hamot. Working with the state Department of Community and Economic Development, EIG recently renewed a six-year commitment to provide $900,000 — $150,000 each year — toward B.E.S.T's revitalization efforts. In the same vein, UPMC Hamot is now supporting B.E.S.T. with a six-year, $175,000-per-year funding commitment. Over the last 12 years, according to B.E.S.T., the nonprofit has used such major funding partnerships to accomplish goals including the demolition of over 40 blighted properties; the creation of 21 new single-family, owner-occupied homes as well as eight new rental properties; coordination of an array of community events and initiatives; and more. The partnerships mark what is "obviously a huge financial contribution. But it needs that," said Bloeser. "We use [that] funding for pretty much everything we do ... [and] there's plenty of work to be done." Michele Gannon – a 29-year-old who works most days at her parents' Orsini's Market at 231 Parade St., and lives right upstairs – agrees. "I grew up in this neighborhood," she said while working at the market one recent afternoon, "and I see everything." Gannon said by all means, she appreciates the work B.E.S.T. is doing, and she's all for the kind of changes it's facilitating. "I like the fact they've taken down a lot of the [blighted] houses," she said. "They were problem houses, and it makes the neighborhood look a lot better." But on any given night, she said, she still sees the same problems on the neighborhood's streets: People fighting, often violently. Young children, entirely unsupervised, outside in the middle of night, with nowhere to go and nothing to do. A couple of months back, Gannon said, she had to pull a gun on two local teens who were attempting to rob the store. They were both apprehended by police about an hour after fleeing. "And the other night, I heard a gunshot," she said, "and I never saw a police car." Gannon said in her opinion, B.E.S.T. should continue what it's doing, only more of it, and should be supported in its efforts. Along with that, though, the city needs to do more, too – like, for instance, "putting more patrol cars in the area," she said. When it comes down to it, even as very-much worthwhile work continues to make way for change for the better, Gannon has also seen a big change over the course of recent years,. "It's not like when I was growing up," she said. "It's worse."